With the upcoming release of Samsung’s flagship Galaxy S10, the Galaxy S10 case has appeared on the market. Combining our past experience, we think that the wallet phone case is the best choice. We have selected some of the Samsung Galaxy S10 wallet cases that have appeared on the market. Each of them has a unique function, providing a folio type case, flip cover, removable, zipper, card holder, kickstand, etc. 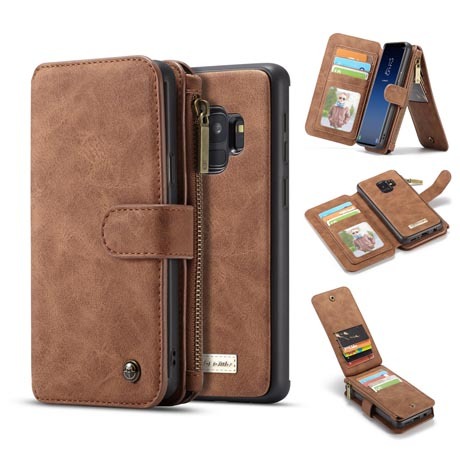 This CaseMe Wallet Case fits perfectly with the Samsung Galaxy S10, with a TPU case lining inside and a PC leather lining on the outside. It has two corner guards and a magnetic clasp for quick on/off. Zipper closures ensure that all important accessories, such as cards, are well protected. It has 14 credit card slots and a transparent window that can display your ID without having to delete it. They also released the Samsung Galaxy S10 Plus Wallet Case, Samsung Galaxy Note 9 Wallet Case and Apple iPhone X Plus Wallet Case, which are new products coming soon, all of which are available for sale in advance.